Hi all and welcome to the MFT November Release Blog Hop! I hope you have enjoyed the past 5 days of MFTeasers... and now... it's RELEASE TIME! All ten new stamp sets, the MFT Kit PLUS some new "Baby Braddies" are available in the store NOW right HERE! You should have come to me from Kim's blog, who is the starting hopper. Make sure to hop through all the designers blogs, leaving comments as you go. ONE of the designers will have a special PRIZE for one commenter... one of the BRAND NEW Pure Innocence stamps that will be released in December! 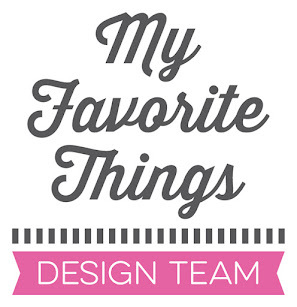 PLUS, the winner will get it early (when the design team does), so it's definitely worth it! The set I am highlighting today is Polar Love. This set was part of a special promotion last month, but is now available for sale! YAY! 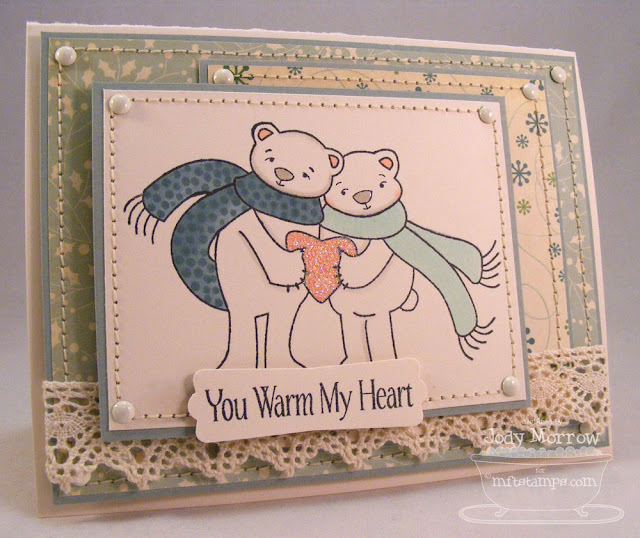 This cute little Polar couple is sure to warm your heart and the set is only $9! Find it HERE, along with all the other new sets and products. Speaking of heart, do you see how my heart looks like cordurouy? 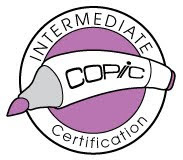 To achieve that, use any piece of grosgrain or textured material, squirt some Copic colorless blender on it, and blot over an image that you have already colored using Copic markers. The pattern will now be on the image. It's a neat effect and is SUPER easy to do. 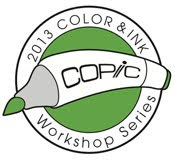 The image was stamped in Memento black and colored with Copic markers. The scarves were paper pieced on. I added some Diamond Glaze to their noses to make them shiny. I stamped the sentiment directly on the patterned paper and then quickly embossed using clear embossing powder. Doing this helps the sentiment to show up more clearly. 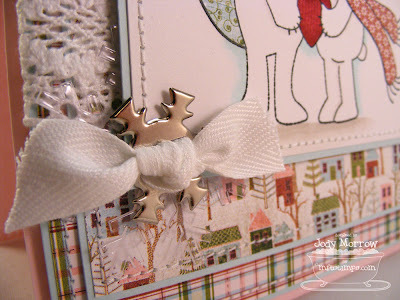 The embellishment in the corner is a Heidi Swapp ghost shape snowflake and a snowflake "ribbon brad" that are stacked together. The ribbon brad has 2 large slots in it to thread the ribbon through and tie. I buy them at Hobby Lobby under the Paper Studio brand name. :) The lace trim is also from Hobby Lobby under the Paper Studio brand name. Here is one more card with more of a vintage feel. Ready to hop on? Next, you'll be visiting the totally awesome (and super-sweet) SUSAN! She is sure to have some gorgeous eye candy for you! Thanks for visiting! :) Time to go shopping HERE! I so love this card! Its been a blast to work on this release with you! I just wish you lived CLOSER!!! Beautiful samples for the release Jody! Such sweet cards, Jody! Love those soft colors! love the lace on both cards. and cute little trick for your heart...i'll have to try it. Your cards are beautiful!! Love the paper piecing!! Such a cute set - I love that paper you used! These could not be any sweeter, Jody! Love the soft colors and the extra warmth the lace trims add! Great job with these! I like the paper pieced scarves and LOVE that DP with the houses all over it! So wintery! SO cute, Jody! I love the colors and the lace! Jody both of these cards are adorable! 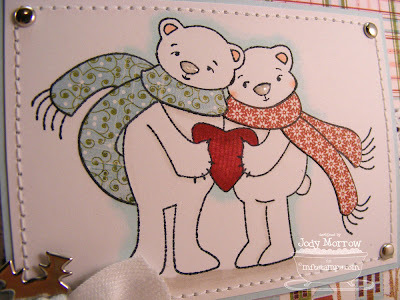 The lace and snowy colors with these cute bears looks fantastic! LOVE your cards! can't wait to get my sets & play!! Love the paper piecing, those scarves screams for it. those bears are so cute! your cards are fab as always. Jody, these cards are so textured and beautiful! LOVE the vintage feel and all the lace! i love them, such pretty cards! Awesome card Jody. I totally love it!!!! Cute cards Jody! I know I love that vintage look! awwww, they are so sweet! GORGEOUS Jody, I love your stitching, adds so much to your beautiful cards. I love this card...it is so gorgeous. That image is too adorable. 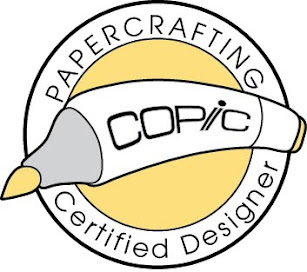 Love your papers and stitching. I am lovin the polar bear! the colors are adorable! So cute! Can't wait to shop! These cards are just darling!I Love your choice in designer papers - they are so fun! Thanks for sharing!!! Awwww, Jody. What adorable little bears. 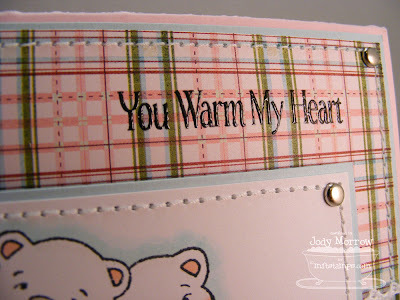 I love all the texture on your cards, from the layers, ribbon and trim to the "corduroy" heart! i love how you have made these sets come alive in these cards, so pretty! I love the corduroy look!!! fabulous work again, Jody! love your sweet little polars. LOVE that corduroy technique Jody...thanks for the tip! Oh wow this is just the cutest. Your cards are awesome. Gorgeous card. Love the image! I love this!! Of course, I love all of your cards!! Your polar bear cards are so sweet. Love the layers & colours. So so so so so cute! Did you use the ribbon in honor of Mel??? Love them!! Both cards are soooooooo cute! Love the embossing on the first one - really helps pop the sentiment on PP. Great idea! And the diamond glaze on their noses is precious! I love your cards. Great work!! Mmmm...love those cozy scarves, Jody! Fab layouts and fun mixes of pp! Really like the way you added the scarves. What a great idea. Love the papers you chose and the stitching looks great. Super cute, as always!! Love the snowflake brad! Love the colors of the first card & thanks for the corduroy tutorial. Aw...you warm my heart with this card!! Great job! This is too cute!! I love everything about this!! !